The age of wireless computing has brought unprecedented freedom and mobility for computer systems users in a variety of circumstances. These days wireless networking products are so ubiquitous and inexpensive that just about anyone can set up a WLAN in a matter of minutes with less than $100 worth of equipment. This widespread use of wireless networks means that there may be dozens of potential network intruders lurking within range of your home or college dorm or office WLAN. Wireless networks don’t stop at the walls of your home. In fact, wireless networks often extend more than 300 feet from your wireless router. If you live in an apartment, dorm, or condominium, you may have dozens of neighbors who can access your wireless network. If you live in a house, your neighbors and even people on the street may be able to connect to your network. By setting up security features on your wireless network, you can make it very difficult for uninvited guests to connect. Aside from just relaxing, Bill Gates has a lot planned for his life after Microsoft, including getting in shape, rhyming with Jay-Z and Bono, and more. Also, find out who gets credit for Microsoft Bob. Video after the break. The Microsoft Office 2007 Compatibility pack is especially useful for users of earlier versions of Microsoft Office, before Microsoft Office 2007. Microsoft has launched its most successful and the best office suite in the form of Microsoft Office 2007. However, when you save a document say in Microsoft Word 2007, the default format in which the file is saved has the extension docx instead of doc. By downloading and installing this compatibility pack, you are ensuring Microsoft Office 2007 Compatibility and also Microsoft Office 2003 compatibility. With this Microsoft Office 2007 Compatibility pack, you will be able to open, edit and save files using the file formats which were introduced with Microsoft Word 2007, Microsoft Excel 2007 and Microsoft Powerpoint 2007. Thus, if you have Microsoft Office 2003 suite, you are ensuring Microsoft Office 2007 compatibility. This compatibility pack can also be used with Microsoft Office Word Viewer 2003, Excel Viewer 2003 and PowerPoint Viewer 2003. Also, if you have Microsoft Office 2007, you have the option to save in Microsoft Office 2003 compatible formats. Say in Microsoft Word 2007, while the default option saves in the docx format you can go to Save As and under there you can choose save in the option compatible with Microsoft Office 2003. Software design engineers(SDE/SDET) at Microsoft apply their technical talents creatively in order to write code, while working closely with program managers to define and prioritize features. They work in a supportive network of smart, diverse colleagues who share a passion for pushing the limits of technology in order to delight and enable customers. There’s tremendous potential for impact. A software development career at Microsoft is much more than just an opportunity to create great products; it can be an opportunity to leave your mark and create a lasting technical legacy. What you do will have a positive influence on the lives of millions around the world, now and in the future. Codes and designs new software, often collaborating as a member of a software development team to create and build products. Oversees a team of software engineers assigned to a product, product upgrade, or software research project. 1. How would you deal with changes being made a week or so before the ship date? 2. How would you deal with a bug that no one wants to fix? Both the SDE and his lead have said they won’t fix it. 3. Write a function that counts the number of primes in the range [1-N]. Write the test cases for this function. While the User Account Control in Windows Vista enhances security on your computer, it is highly annoying and people comfortable with it should turn it off. 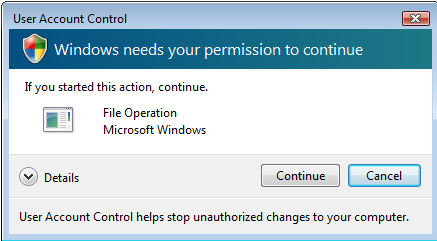 There are a number of ways you can disable the highly annoying User Account Control (UAC) in Windows Vista. You can do it through the Registry, through an advanced system option called MSCONFIG, but here we will tell you how to disable the User Account Control in Windows Vista using the easiest of the methods … through your Control Panel. Two clicks and you are all set. User Account Control (UAC) is a major security component in Windows Vista. Windows Vista is the most secure version of Windows that Microsoft has ever developed and UAC is a major part of it. 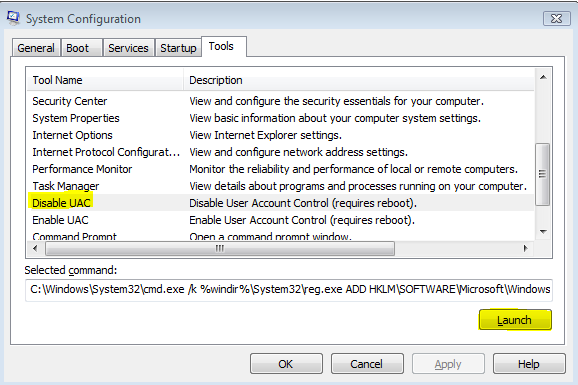 Unlike previous versions of Windows like Windows XP , Windows 2000 and beyond, when an administrator logs on to a computer running Windows Vista, he logs on as a regular user without admin rights. The Admin rights are only invoked when a user needs to perform a task that requires administrator privileges, such as when you wish to install and application or running setup files. While UAC is an important enhancement for Windows Vista, protecting users from malware which might get installed silently, it is highly annoying as almost every other task you do invokes administrator rights. For home users, it is a lot fo additional clicks everytime. Also, if you are giving a presentation in front of a class or in front of a meeting, you might want to disable UAC otherwise you will see something like the image below. Step # 3: Click the Tools tab. Scroll down till your see Disable UAC. Click on it and press the launch button below.